North Board Presentation: The annual divisional awards were presented in The Thatch, Ballycommon on Sunday last the 31st January. 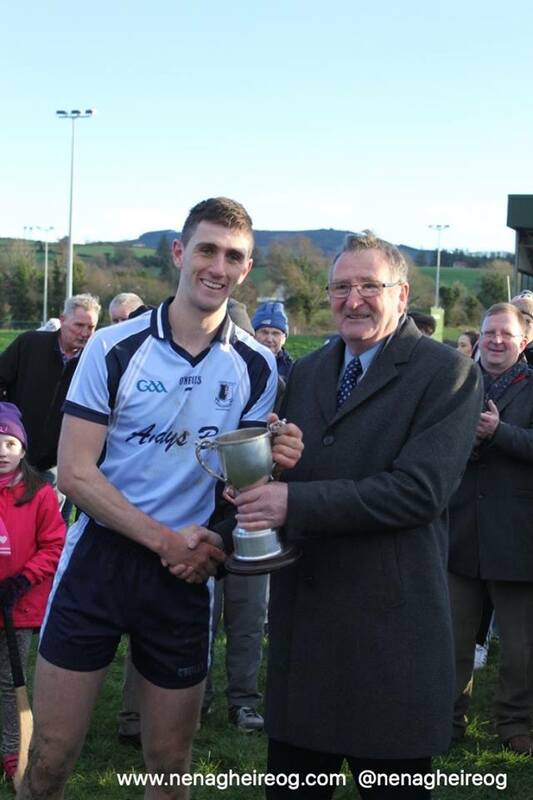 Congratulations to Andrew Coffey who received the player of the year award in U21 hurling. National Clubs draw: The Nenagh Éire Óg club is participating in the 2016 national club draw which features some sensational prizes. The top prize is an Opel Corsa and the other prizes include a trip for 2 with the All Stars next year, All Ireland Hurling and Football Final Packages for 2 (including premium level tickets, overnight accommodation and an evening meal) and travel vouchers. In total there are 14 prizes. This year, the GAA is introducing a specific draw for all clubs who record, account for and sell a minimum of 200 tickets whereby one club in each county will receive a prize of €1,000. A draw will also be take place for all Counties whereby 3 clubs will receive a prize of €5,000 and the Club with the highest ticket sales in each Province will receive a prize of €1,000. Furthermore there will also be a confined draw for €500 specifically for people who enter the draw through the Nenagh Éire Óg club. Tickets are priced at €10 and available from draw coordinator Derek Lillis any officer of the club or committee member. Please support the Blues in this fundraising initiative! Membership: A reminder to everyone that membership for 2016 is now due and can be paid to any club officer or online. All players and mentors must have membership paid up by the commencement of the playing season. The cost of membership is again very reasonably priced at €25 with a family membership option A priced at €60 and an option B priced at €85. Juvenile club flag day: Thanks to everyone who assisted and supported our Juvenile Flag Day on Saturday and weekend Masses. Your kindness is much appreciated. Éire Ógres are back: Nenagh Éire Óg GAA Camp For Beginners returns for 2016 each Saturday, February 6th to 27th, at the MacDonagh Park complex on St. Conlon’s Road from 10-11am. This program is open to all boys born 2009-2011. Perfect for junior/senior infants and boys of the age who will start school in September to get active after the long winter, improve their hand/eye coordination and agility and make friends in a safe and fun environment. No equipment is needed, just tracksuit and trainers. Tea/coffee/scones will be provided for parents. Under-6 hurlers who enjoyed last year’s camp so much are very welcome to return to catch up with their friends. The cost is €10 for the month and the boys will be presented with a certificate and a special new design Éire Ógres t-shirt on completion of the course. Call or text Shane on 087 6373830 or Catherine on 086 0855165 for more information or to register. Handball Club: The Secondary Schools County finals took place in North Tipperary on Saturday. In the girls junior singles Mary Ellen Phelan, Presentation, Thurles defeated Nenagh Handball Club’s Katie Morris, St. Mary’s Nenagh in the final, while in the junior doubles Sile Spain and Eimear Meagher (Nenagh Handball Club) got the better of Lauren McGuigan and Maeve McNeill, Presentation, Thurles. Our own Sinéad Meagher, St. Mary’s Nenagh beat Roisín Cahill, Borrisokane CC in her county final. Well done to our three girls on great performances. The Munster Schools finals will be held in North Tipp this weekend. The best of luck to all involved. Please check club Facebook page for fixtures updates. The 2016 Cumann Na mBunscoill Munster Handball Finals, are fixed for Saturday 6th February 2016 in Ballydesmond in Cork. The very best of luck to club members, Ava O’ Brien and Ciara Morris will represent Tipperary and Ardcroney N.S. There will be a meeting on Thursday, Feb 4th in the complex for all parents of players, trainers and committee members. Please make every effort to attend. Contact Eamonn on 087 4185911 if unable to attend. Camogie Club: Winter Training: Our winter training continues for all our teams. On Tuesday in the running complex in Ballygraigue there is a session for our under-10, under-12 and under-14 teams from 19:20 – 20:00, for under-14, under-16, under-18 and intermediate from 19:50 to 20:30. There is also a strength and conditioning session on Friday evenings in the complex in MacDonagh Park. Times for this session will be relayed to the players on Tuesday evening. A cost of €2 will cover both sessions. All our teams will be back training soon and mentors will be in contact with the details. Registration Night: We had our registration night last Friday evening. We wish to thank all who showed up on the night. Anyone who hasn’t registered contact Caitriona Morris (087 7776135) or your team manager. The Éire Ógres are back ! Nenagh Éire Óg GAA Camp For Beginners returns for 2016 each Saturday, February 6th to 27th, at the MacDonagh Park complex from 10-11am. This programme is open to all boys born 2009-2011. Perfect for junior/senior infants and boys of the age who will start school in September to get active after the long winter, improve their hand/eye coordination and agility and make friends in a safe and fun environment. No equipment is needed, just tracksuit and trainers. Tea/coffee/scones will be provided for parents so don’t rush your breakfast. 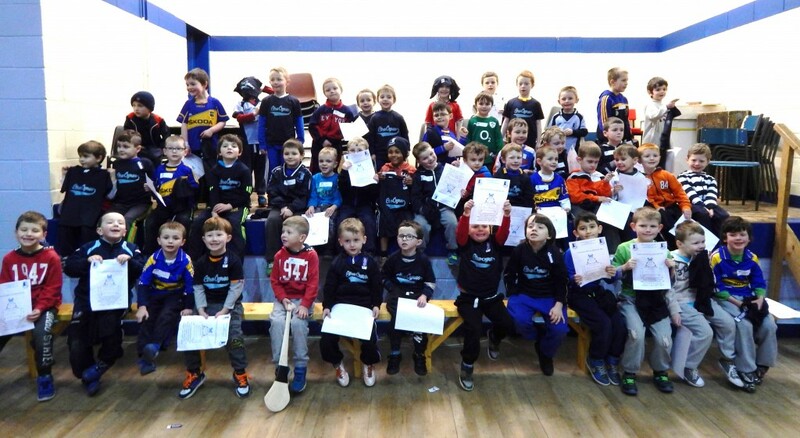 Under-6 hurlers who enjoyed last year’s camp so much are welcome to return to catch up with their friends! The cost is €10 for the month and the boys will be presented with a certificate and a special new design Éire Ógres t-shirt on completion of the course. County SH Championship 2016: Our senior hurlers have been drawn to play Kiladangan, Templederry Kenyon’s and Mullinahone in the group stages of the 2016 County SH championship. North Board Presentation: The annual divisional awards will be presented in The Thatch, Ballycommon on Sunday 31st January commencing at 6pm. 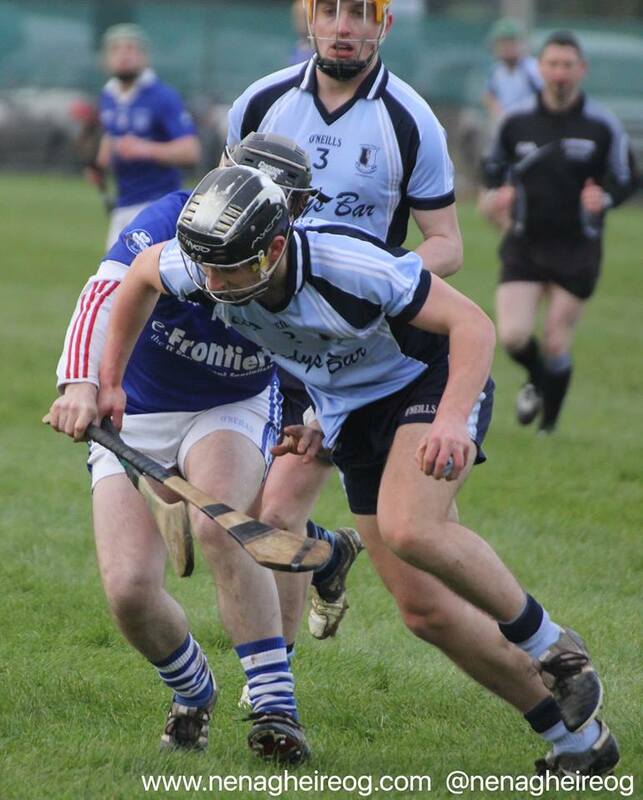 Congratulations to Andrew Coffey who will receive the player of the year award in U21 hurling. Winter training for juveniles continues on Tuesdays at the running track and Fridays in the complex. Please keep up the good work. The Éire Ógres beginners camp returns this year for the four Saturdays in February from 10-11am in the complex. Again, no hurleys or helmets needed as the boys will focus on fun, fitness and hand-eye coordination. For more information or to register, contact Shane on 087 637 3830 or Catherine on 086 0855165. Winter Training: Our winter training continues for all our teams. On Tuesday in the running complex in Ballygraigue there is a session for our under-10, under-12 and under-14 teams from 19:20 – 20:00, for under-14, under-16, under-18 and intermediate from 19:50 to 20:30. There is also a strength and conditioning session on Friday evenings in the complex in MacDonagh Park. Times for this session will be relayed to the players on Tuesday evening. A cost of €2 will cover both sessions. All our teams will be back training soon and mentors will be in contact with the details. Registration Night: We will be having our registration night on January 29th in MacDonagh Park, 6-8pm. We ask all our players to please make a special effort to register on the night. Under-21A: Our U21A hurlers bowed out of the county championship last weekend when losing to a better all-round Thurles Sarsfields side. Well done to the players and team management, whom despite the inclement weather that has been associated with this campaign from the start, put in a huge effort and workload over the past few weeks which saw us secure a North title along the way. Congratulations to Thurles Sarsfields and we wish them well in the County final. This ends our 2015 activities as we now look to 2016. 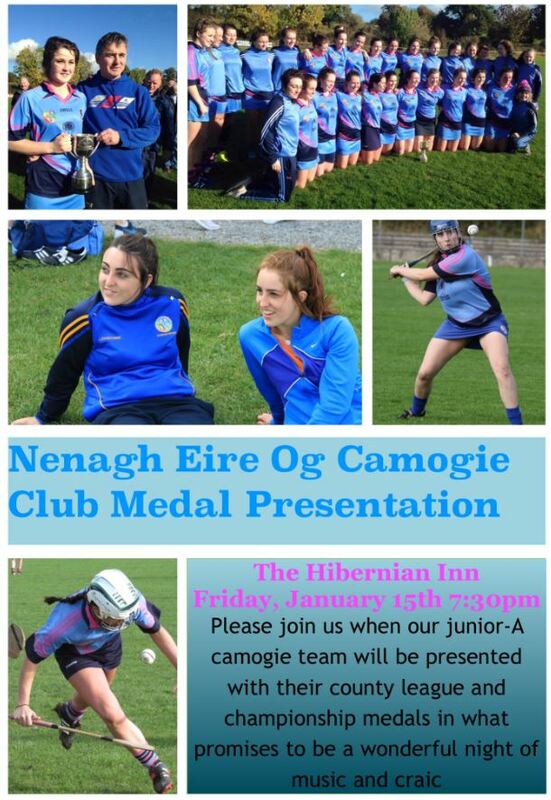 Medal Presentation: In 2015 our camogie section reached another milestone when they captured both the county Junior-A league and championship double. This great panel of players received their hard earned medals at a function in the Hibernian Inn on Friday evening last. We wish to thank Martin Morris and his staff for the warm welcome and hospitality, Caitriona Morris and the camogie committee for organising the event and all who showed up on the night to share with the ladies their great success. We also wish to thank Collin’s Bakery Nenagh for kindly baking a cake to celebrate our promotion to the intermediate ranks. The players will be back training shortly in preparation for 2016 and we wish them and their new manager Paul Henry the very best of luck for the year ahead. Please see our Facebook page for photographs from the night. Winter Training: Our winter training continues for all our teams. On Tuesday in the running complex in Ballygraigue there is a session for our under-10, under-12 and under-14 teams from 19:20 – 20:00, for under-14, under-16, under-18 and intermediate from 19:50 to 20:30. There is also a strength and conditioning session on Friday evenings in the complex in MacDonagh Park. Times for this session will be relayed to the players on Tuesday evening. A cost of €2 will cover both sessions. In 2015 our camogie section reached another milestone when they captured both the Junior-A league and championship double. The great panel of players received their hard earned medals at a function in the Hibernian Inn on Friday evening. We wish to thank Martin Morris and his staff for the warm welcome and hospitality, Caitriona Morris and the camogie committee for organising the event and all who showed up on the night to share with the ladies their great success. We also wish to thank Collin’s Bakery Nenagh for kindly baking a cake to celebrate our promotion to the intermediate ranks. The players will be back training shortly in preparation for 2016 and we wish them and their new manager Paul Henry the very best of luck. 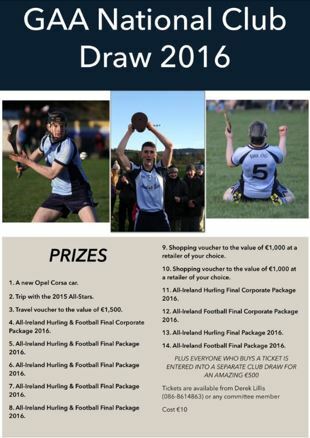 The Nenagh Éire Óg club is participating in the 2016 national club draw which features some sensational prizes. The top prize is an Opel Corsa and the other prizes include a trip for 2 with the All Stars next year, All Ireland Hurling and Football Final Packages for 2 (including premium level tickets, overnight accommodation and an evening meal) and travel vouchers. In total there are 14 prizes. •	A draw will be done per County whereby 1 Club in each County will receive a prize of €1,000. •	A draw will be done for all Counties whereby 3 Clubs will receive a prize of €5,000. •	The Club with the highest ticket sales in each Province will receive a prize of €1,000. There will also be a confined draw for €500 specifically for people who enter the draw through the Nenagh Éire Óg club. Tickets are priced at €10 and available from draw coordinator Derek Lillis any officer of the club or committee member. Please support the Blues in this fundraising initiative! 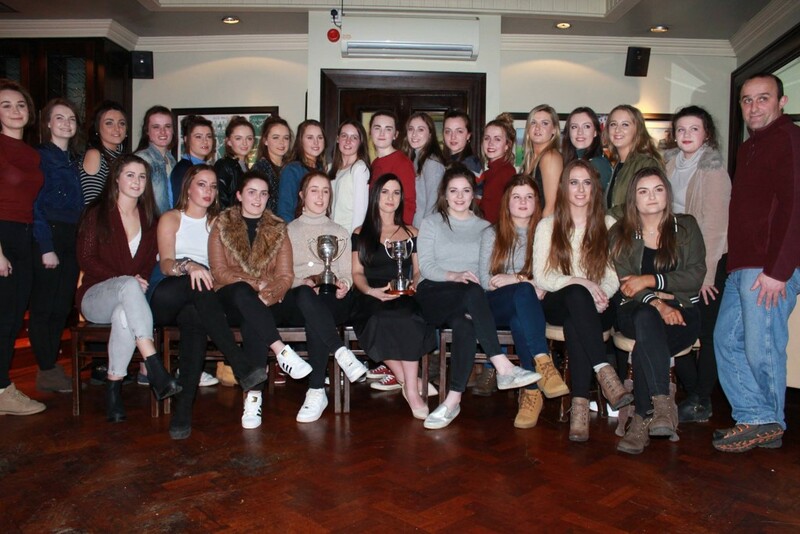 Our Junior A Camogie team had a phenomenal year in 2015 when they won both the county league and championship. You are invited to join with us in celebrating these wonderful achievements in The Hibernian Inn on Friday evening at 7:30pm. In particular we wish to invite all our former players, mentors, committee members and supporters for what promises to be a great night of food, music and craic. 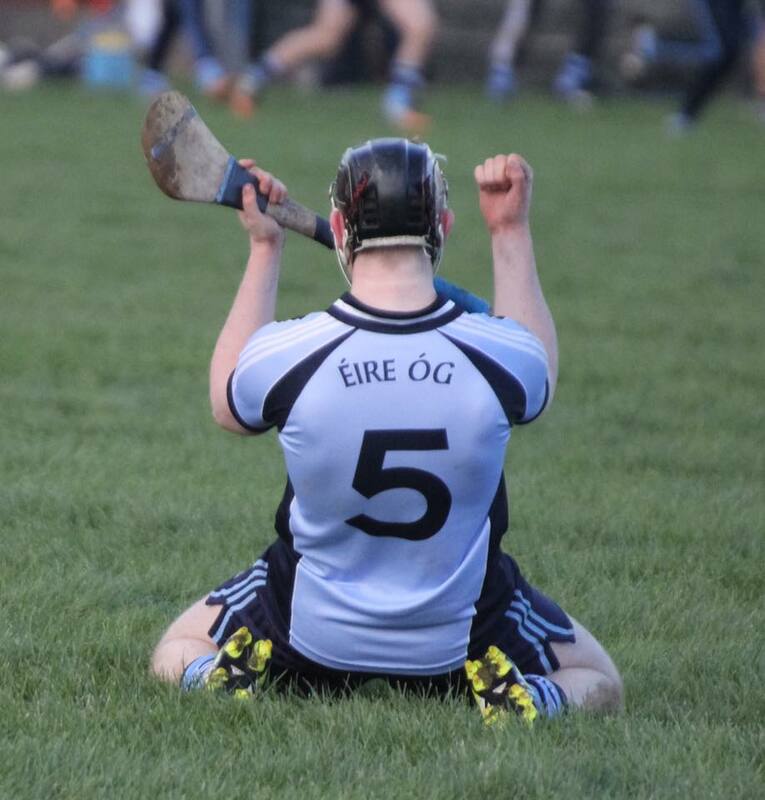 On Sunday last Nenagh Eire Og ended a long wait at this age for a divisional final when the team staged an amazing comeback to seal a memorable victory over a gallant and superb Kildangan side who had deservedly went in at the break seven points to the good having led by nine at one stage. John Cahalan opened the scoring with a fine long range effort prior to the excellent Jack Loughnane levelling the sides and before Dan O Meara sent a blistering shot into the corner of Daire Gleeson’s goal. A pointed Shane Hennessy free and a fine Andrew Coffey effort reduced the margin to one but it was to be the closest Nenagh came to their opponents during the opening half hour. Tadhg Gallagher and Loughnane both pointed to open the margin to a goal before James Mackey hit back with one of his own. Kildangan then benefitted from the blinding winters sun shining into the old scoreboard end when Jack Loughnane’s long range effort deceived the unfortunate Daire Gleeson for the champions second goal. The goal lifted Kildangan’s spirits and Gallagher and Johnny Horan both pointed to extend their lead. 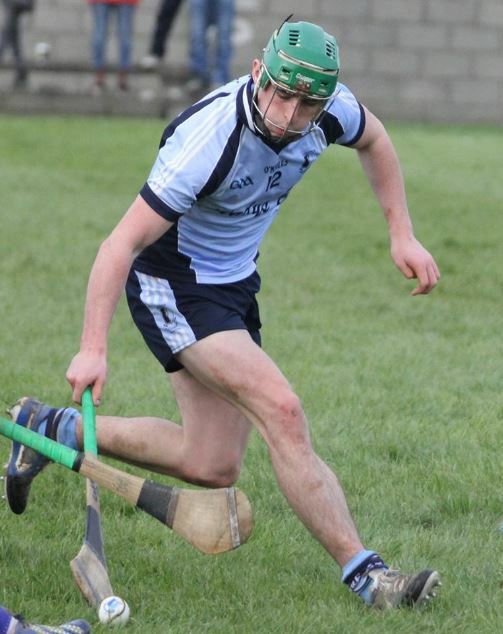 Andrew Coffey, who was Nenagh’s best player throughout, pointed to briefly stem the Kildangan tide but full forward Paul Flynn found the unmarked Ciaran Kelly and blasted home their third goal and extend the lead to nine points. Few, if any in the large crowd could see any way back for the Blues’ at this stage. Points from Coffey, Mackey and Hennessy did offer the town side hope at the interval and with Kildangan getting one of their own, left seven between the sides at the break. If Nenagh were to have any hope of a comeback it was vital that they get the first score of the second half but it was their opponents who struck first through Andrew Loughnane. Hennessy pointed well from a placed ball before scoring another in-between two fine efforts from Andrew Loughnane and Paul Flynn to leave eight between them in the 36th minute. This Nenagh team have won a lot of championship honours through the age groups and have a resilience that was to stand to them for the remainder of the game. At no stage did they panic or start going for goals, instead they maturely kept picking off their points to get themselves back into contention. Shane Hennessy, Andrew Coffey, Gary Howard and super substitute Bob O Brien all pointed to reduce the margin to five, 0-14 to 3-10. Kildangan were dealt a massive blow at this point when Tadhg Gallagher, arguable their best player up to this stage, left the field with an injury and three minutes later they received another sucker punch with a brilliant Gary Howard goal following great work from captain Barry Heffernan. Two more points from Hennessy and Coffey levelled the sides and it appeared as if Nenagh were about to, remarkably, pull this game out of the fire. Six minutes from the end Andrew Coffey, from a tight angle, gave the Blues’ the lead and with two minutes of normal time remaining Philip Hickey doubled the margin much to the delight of their large and vocal supporters. Kildangan did not go down easy and fought to the bitter end. Flynn reduced the margin to one and the Nenagh backs were under severe pressure but their discipline and determination held firm and time and again they cleared. There was more drama in the 65th minute when referee Kieran Delaney awarded Kildangan a free 30 meters from goal. With their main free taker side-lined Barry Hogan was summoned from the goal but his effort went agonizingly wide. Shortly after Delaney signalled full time much to the delight of players and fans of the Blues. 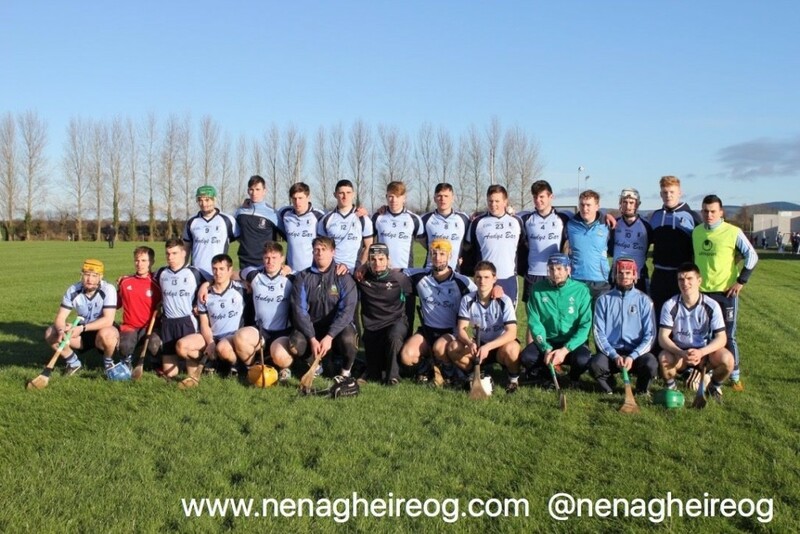 Nenagh Éire Óg: Darragh Gleeson, Gavin O’Connor, Michael Collins, Ger O’Gorman, Conor Ryan, Adam Gratton, Barry Heffernan (captain), Killian Gleeson, James Mackey (0-2), Andrew Coffey (0-6), Philip Hickey (0-1), John Cahalan (0-1), Gary Howard (1-1), Shane Hennessy (0-6, 0-4 frees), Aidan Healy. Subs: (38th) Bob O’Brien (0-1) for John Cahalan, (39th) Adam Carey for Aidan Healy, (56th) Christopher Ryan for Killian Gleeson, (62nd) Killian Gleeson for Christopher Ryan. Kildangan: Barry Hogan, Darragh Molloy, Alan Flynn, Jim Minehan, James Quigley, Johnny Horan (0-1), Declan McGrath, Jack Loughnane (1-3), Tadhg Gallagher (captain, 0-2, 0-1 frees), Darren Moran, Dan O’Meara (1-0), Andrew Loughnane (0-2), Ciarán Kelly (1-0), Paul Flynn (0-2), Tom McLoughlin. Subs: (43rd) Darren Ryan for Tadhg Gallagher, (52nd) Cathal Hayes for Ciarán Kelly. Under-21A: The 2016 playing year kicked off in the best possible fashion when our u21 hurlers won a thrilling North u21 final. Coming from 9 points down during the 2nd half, they then held on to win an absorbing contest. Well done to all players, team management and backroom staff and hard luck to a very magnanimous Kildangan side who lost nothing in defeat. We now play Thurles Sarsfields in the county semifinal. Watch social media for fixture updates throughout the week. Membership: A reminder to everyone that membership for 2016 is now due and can be paid to any club officer or online. The cost of membership is again very reasonably priced at €25 with a family membership option A priced at €60 and an option B priced at €85. Volunteer Appeal: With the numbers we currently cater for, there is a huge need and opportunity for more people to become more involved in the day to day running of club affairs so that fresh faces can bring fresh ideas forward. Whether you are currently involved or on the periphery, whether you have skills in administration or coaching, we are actively seeking volunteers to come forward, If you are interested in getting involved in any capacity call 0872850732, contact any club officer or email eireogneneagh@gmail.com. Club Lotto: The Nenagh Éire Óg Club Lotto represents the club’s key fundraising initiative. Please consider supporting the Blues by playing our club lotto online: click here! Juveniles: Winter training classes classes will continue on Friday night at the following times: 10/12s girls and boys to be in complex at 6.50pm to start at 7pm, 14/16 boys in complex at 7.50pm to be ready for 8pm. Running Tuesday night at 7.30pm for 10/12 and 8pm for 14/16. 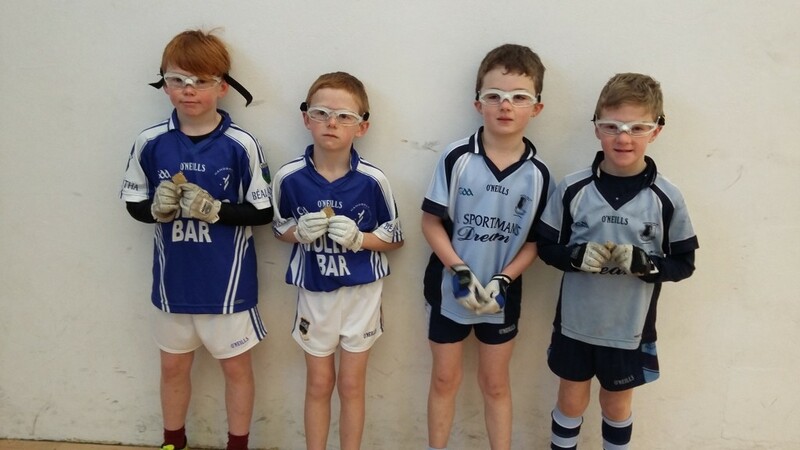 Handball: Hard luck to Billy O Brien and Eoin Garrigan who lost out in their under-10 North Final at the weekend. If you need to contact Éire Óg please do so via our Contact page. You can also keep in touch by accessing our Facebook page or by following @nenagheireog on Twitter. 2016: Best wishes for 2016 to everyone involved with the Nenagh Eire Og club. Membership: Membership for 2016 is now due and can be paid to any club officer or online. The cost of membership is again very reasonably priced at €25 with a family membership option A priced at €60 and an option B priced at €85. Volunteer Appeal: The evolution of the Club over the last number of year , in terms of its size and structures has led to an inequitable spread of the workload across the membership and placed a very heavy burden on certain individuals. In 2015 the Nenagh Éire Óg club catered for over 500 members and this continues to grow. This offers a huge opportunity to have many talented people currently associated with the Club to become more involved in the day to day running of club affairs so that fresh faces can bring fresh ideas forward. Whether you are currently involved with the club or on the periphery, we are actively seeking volunteers to come forward. People get involved in the club because they want to not because they have to, If you are interested in getting involved in any capacity call 0872850732, contact any club officer or email eireogneneagh@gmail.com.